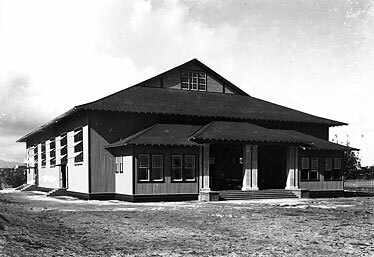 Kauai High School Gym, 1939. The hill above Nawiliwili was called Ke Kuhiau, which translates as "high point," and it was one of three heiau located near Kalapaki Bay. The residence of Gov. Kanoa stood there before annexation, and later it became the courthouse and county offices. When new county buildings were built on Rice Street, Kauai High School was established on top of the hill. It was "the fifth high school of the Territory of Hawaii and the first high school on the island of Kauai" ("75th Anniversary Kauai High & Intermediate School" publication). Kauai High School opened on Sept. 14, 1914, the same year World War I began. Seven students graduated in 1919; numbers climbed to about 100 per class in the 1930s. During the '20s and '30s, some students lived in private dormitories, bungalows were built as classes were added, sports were introduced and students enjoyed dances and theatrical performances. The original school building was torn down in 1931, and the gym (still in use today) was built in 1939. In 1941, World War II erupted; this had a major impact on the education kids had during this time. The bombing of Pearl Harbor led to the closing of Kauai High from December 1941 to September 1942. Many seniors left to enlist. In 1943 the school started the Stamp and Bond Sale to help with the war. Two years later, in 1945, labor was greatly needed because of the war. Students worked at the sugar plantations on Fridays, Saturdays and holidays. The pineapple company hired kids from ages 14 and up to work in the fields, and students 16 years old and up worked in the cannery. After the end of World War II, the number of graduates dropped to 150 from about 175. Despite the decrease in enrollment, students formed a school court, student council and a student police force in 1946-1947. Some of the electives that were offered were Spanish, yearbook, woodworking, speech, homemaking and news writing. Students formed football, basketball, baseball and track teams and took a number of Kauai Interscholastic Federation titles. More changes came to Kauai High School during the 1950s with the addition of aviation science, young farmers and solid-geometry courses. During the 1950-51 school year, students in the radio class operated amateur radio station KH61K, the only radio station owned and operated by a high school in the territory. "I" building was built in 1952, followed by "H" building in 1953. The graduating classes during the '50s averaged 174 students per year, about half the size of a graduating class today. Barbara Kaya attended Kauai High from 1954-55. "Our freshman class was about 100 people," she said. "There was the old community college to the west of the campus." Kauai Community College moved from Kalaheo to the Kauai High campus in Lihue during 1952. "Kauai High School had a very strict dress code," said Carmen Butacan, who attended Kauai High from 1958-61. "The girls wore dresses, skirt and blouse, and shoes. Shirt and long pants with shoes were required of the boys. No slippers or shorts were allowed except when cleaning or special days given by permission." "Sports were exclusively for boys," Roberto Butacan added. "I played football, basketball and baseball for four years, and I was on the track team during my freshman year." The '60s was a time when students were encouraged to "do your own thing," and Kauai High was a part of that approach to life. Clubs, activities and committees seemed limitless, and at Kauai High School that was just the beginning. They had added numerous clubs, like the National Thespian Society, Explorer Post, Y-Club and lots more. Kauai High School had about 190 seniors in the '60s. As the '70s rolled in, the school's senior class grew to 249 students, and more clubs, activities, sports and classes were added. A homemade dynamite bomb was found in the "K" building boys' restroom and fortunately was defused. The old "A" building was torn down, and there were plans to build a new, two-story, 12-classroom building. In the 1970s they built the cafeteria, library, administration building, "K" building and the swimming pool. Kauai High greeted the '80s after a statewide, six-week strike that left classrooms uncleaned, lunches unprepared and, later, the school unopened. The decade also started with the construction of "A" building. The new "A" building was much needed; the 11-classroom building would house new special classrooms designed for science, business, and home economics. Karen Higa worked at Kauai High during this era of strikes, construction and change. From 197795, she worked as the school administration services assistant under the supervision of five principals: Setsuo Ushio, William Dutcher, Alice Zenger, Wallace Kawane and Linda L.T. Smith, the current principal of Kauai High. In addition to campus improvements, Higa noticed an influx of "more foreign students and mainland students -- not too many from the mainland, but mostly from the Philippines." In 1998 the six-period day was abandoned in favor of block scheduling, and in 2000 the intermediate grades went to Chiefess Kamakahelei Middle School. There has been no new construction, but in 2003 the campus was given a face lift. Kauai High is proud of its long history and of its record of excellence in many fields, from the performing arts to Mock Trial and Key Club to football and soccer. Ian Agpaoa, Malia Koerte, Dalston Miyasato, Micah Mizukami, Chysen Nagao, David Ochoco and Edward Skripko contributed to this report. Members of the Kauai High Singers and Kauai High Chorus, shown here in concert, will study with the New York City Opera in March. "I want to wake up in the city that never sleeps," is a lyrical line from Ebb-Kander's song "New York, New York." 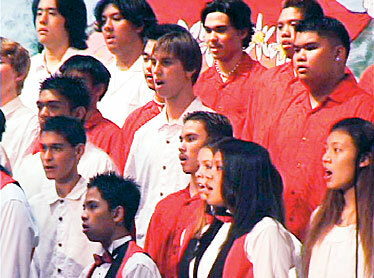 The Kauai High Choir and the Kauai High Singers performed that piece in their fall concert in 2006 when they launched their dream. Now they are taking that song into reality, as they have been granted the opportunity to go to New York and sing with the New York City Opera. David Conrad, choir director and music teacher at Kauai High School, wants students to experience "how something that seems so far away can be accomplished if a person studies and networks and learns from professionals." Conrad began taking students to the Hawaii Opera Theatre five years ago "to develop interest," and he believes this trip can awaken students to the possibility of a career in music. The choir students are practicing opera music from "Carmen," "Madame Butterfly," Verdi and "Cavalleria Rusticana." They are practicing hour after hour, sacrificing Saturday mornings and Monday nights to make Kauai High School remembered throughout New York City. Reaching the goal of New York City has not been easy. Conrad had to apply and be accepted by the prestigious Student Ovations Program affiliated with the New York City Opera. Then the students and their parents had to go through various stages of planning and fundraising. Families made monthly deposits of $115. In addition, students sold discount coupons and concert tickets and walked in a walk-athon. Parents sold snacks at the concerts and put together silent auctions to raise money. "All the hard work paid off," said sophomore Azlynn Abara. The students cannot take all the credit, though. Many people reacted positively toward the idea of Kauai teens advancing their music skills in the Big Apple, and donations large and small came in from the Kauai community and beyond. The group received more than $63,000 (51 percent of the budget) in grants and donations. Fees from students and chaperones amounted to $43,275 (33 percent), and fundraising brought in $23,840 (18 percent). "I'm thankful for all the help, and I'm very excited to go," said 11th-grader Keanu Rego. All 32 students are excited to go and not at all fazed by the schedule they have to follow once they reach their destination. They will be in New York for the first week of spring break, March 14-22. Conrad organized meals as well as the sightseeing, entertainment and performances for the week. One of the priorities of the New York trip is to "bring the culture of Hawaii and spread the aloha in NYC," said Mele Ng, a junior who is president of Kauai High Singers. They will perform songs from their fall concerts as well as Hawaiian songs. Making this trip a reality has required plenty of determination. "I'm sure that all of our work will end up being amazing," said Alyssa Lardizabal, KHS sophomore. The desire and hard work of all 32 students will help them soar high when they appear at Lincoln Center with members of the NYC Opera. Ian Agpaoa, Danielle Ola and Misty Watkins contributed to this report. What comes to mind when you look at this sculpture? 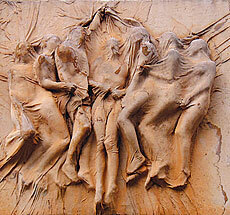 Seven students were covered in plaster in 1975 to create the 9-foot-wide relief mural that hangs in the courtyard at Kauai High School. The artist, Joe Hadley, called it "Struggle." "People being trapped, not being able to move and breathe." "Souls coming out of the building. The bodies pop out so it looks like they're coming out of something. I think it's supposed to do with life." "It's really interesting. I think it's about the different cultures coming together in unity, like one big happy family." "I think it's quite disturbing. It looks like the people are trying to bond together, and I don't really understand why it's put on the wall in a school setting." "It reminds me of killing someone by putting a bag over his face, like the feeling that you have when you are in high school and you just want to grow up and leave school."